Campingplass Les Sablons er en campingplass i Portiragnes, Hérault, som ligger ved sjøen og ved innsjø/vann. Denne campingplassen har steder med avgrensning, med skygge og plasser med noe skygge. Camping Les Sablons ligger i nærheten av en sandstrand. Det er mulig å leie stasjonære campingvogner og hytter. Campingplassen har lekeplass, innendørs lekeplass og idrettsplass. For sportslige feriegjester arrangerer campingplassen utflukter, fotturer med guide og ulike sykkelturer. Det er underholdningsprogram og trimrom. For dem som vil slappe av etter en travel dag er det boblebad og skjønnhetssalong. Campingplassen har badeland, utendørs svømmebasseng, innendørs svømmebasseng med skyvetak og barnebasseng. Det er også vannsklie. I nærheten av campingplassen kan man svømme i en sjøen. Ved Camping Les Sablons kan man drive med vindsurfing og vannskikjøring. Det er ikke alltid nødvendig å lage mat selv, for på campingplassen er det snackbar, pizzeria, kafeteria, restaurant (begrenset meny) og restaurant (med omfattende meny). På campingplassen kan man også kjøpe nybakt brød. Det er mulig å bruke internett, for campingplassen har én eller flere computere med internettilkobling, det er WiFi-tilkobling og på 80% av campingplassen kan man få tilgang til internett med egen laptop. Denne inspektøren besøker hvert år Campingplass Les Sablons og inspiserer campingplassen for ca. 200 fasiliteter og for andre punkt som forekommer. Inspektøren er en medarbeider fra ACSI og arbeider ikke for campingplassen. This campsite will blow you away - it is amazingly good value, especially if you visit off peak. The pitches are very spacious, and it’s right on the beach. The pool(s) are superb, especially the adult pool. Great food options: cafe, takeaway, restaurant, large bar area plus a full supermarket onsite. Bus outside the gate takes you to Beziers. Initially given a pitch with a tree in the middle, requested another and given a much better one. Huge site, our pitch 15min walk to reception and main facilities, although sanitary block quite close - which was modern and well maintained. Site on a lovely beach with lifeguard station, beach stretched a long way. All facilities good, but no local bus service at the site, so unless cycling, had to walk. Not easy in 30C+ heat!! Reminded us of Butlins - self-contained and emphasis on children. We will not be returning. Deserving of 5 stars on pool alone. Superb. We used the adult only pool, obviously very new, immaculate. Family pool are is the best we have come across. Excellent shop/bakery on site . Planning to visit again next year. This was an unplanned holiday stop - we stayed at Les Sablons for 10 nights in our motorhome. Very quiet while we were there in May but, even so, most of the facilities were "on the go". Very friendly and helpful staff in reception and on site. We are OAPs but this is an ideal site for families with much to do for young children. A well stocked and reasonably priced Spar grocery at the site entrance and also a good bakery with delicious bread and other "treats". Some interesting birdlife on the small lake alongside the camping. Access to the wonderful beach is easy ~ and I noticed that it was cleaned daily, even though it was low holiday season. Highly recommended. First visit to this site, but definitely won't be the last. Great location, so close to the beach AND the canal du midi for cycling. Busy but welcoming site, excellent pool complex, and really good pool activities... especially the daily aquagym workout with the tireless Paul and his team. Inspiring enthusiasm by him every day - a great start to the day. Camping is located directly by the beach, but since all the rental units are located in that area there is fairly long way to walk from the camping pitches until you reach the beach. Animation is good with mini-disco and workouts (in the sun) and a nice restaurant area near the scene. The pool is ok but since children can not ride the slides alone the plus of pool turns into a big minus with VERY unfriendly staff. The toiltes in the front were we were were clean but the ones in the back (big camper area) did smell really bad. If you dislike mosquitos then stay away... the children got 20 bites the first day... in the sun... Big mosquito grills were placed at the toilets to take care of some but it was an invation. A lovely campsite to suit all ages. Young children well catered for with playgrounds, pools and entertainment. Excellent visible security on site. Restaurant is expensive and average. Good sized emplacements kept to an excellent standard. Efforts to improve facilities have been ongoing for a number of years. New toilet blocks, new bar and surroundings, wifi on site, to name a few. Noisy around bar area after midnight because of disco, but no problems elsewhere on site. Vil du booke campingplassen Campingplass Les Sablons eller få mer informasjon? Det går bra med opplysningene nedenfor eller via campingplassens nettsted. 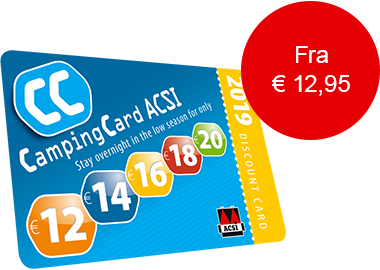 ACSI Eurocampings sender din forespørsel til "Campingplass Les Sablons".